One of my favorite ways to recommend essential oils is to help with stress and anxiousness. These are anxious times, the world seems uncertain, many of us have kids who are growing up and switching schools, maybe even going to college. Financial, political, health struggles can abound and finding tools to support ourselves is essential. Today, a little bit about my most favorite essential oil blend for anxious times, Balance. Balance is a combination of Blue Tansy, HoWood, Blue Chamomile, Blue Spruce, Frankincense, and Osmanthus in Fractionated Coconut oil. It can be used topically or aromatically, but should not be taken internally. I like to use Balance in my yoga and meditation practice for its calming and grounding effect. Think of Balance like Baddha Konasana in a bottle. It helps you feel rooted and still when your mind might be all over the place. Try Balance before sitting for meditation, or at the end of a yoga practice for Savasana. Place a few drops in your palms or on the soles of your feet. Inhale deeply from your hands or massage the oil into your feet. Close your eyes and breathe deeply for ten breaths, focusing on the exhale half of your breath. Notice that the chatter in your mind tends to slow down, and the anxious thoughts quiet a bit. My personal uses of Balance are many, but I do use it three ways every single day. First, I take a drop of Balance on my palms and massage it into my heart line. This helps me feel connected to my heart and reminds me to breathe. Second, I combine Balance and Serenity blends in the diffuser each night at bedtime for restful sleep. I recommend equal parts of these two incredible blends. 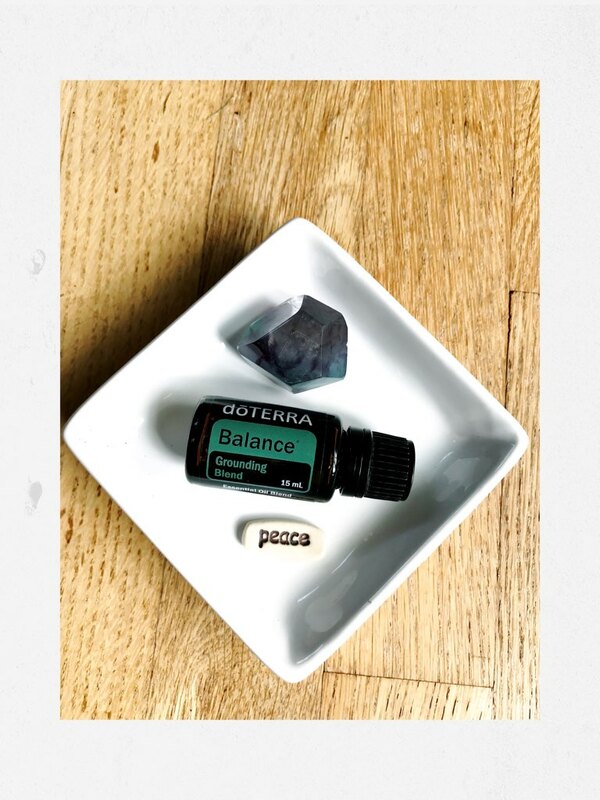 Finally, I take a few drops of Balance and mix it with dōTERRA’s unscented lotion and rub it all over my feet and legs to feel grounded at bedtime. I will be posted a new essential oil tip every Monday. Please reach out with any questions about essential oils. To purchase dōTERRA essential oils at 25% off, the purest oils available, go to my website and click “Join and Save” at the top. Nancy’s Website.